Medical and Dental College admission test which is also known as MDCAT test is for getting admission in Public sector and Private sector medical colleges of Punjab. Every Year University of Health and Sciences (UHS) conduct MDCAT test for MBBS and BDS admission in Public sector and Private sector medical colleges of Punjab. There are limited seats available in public and private sector medical colleges of Punjab and thousands of students appear in MDCAT test every year. However only few students can secure admission due to high competition level. MDCAT test will consist of 220 MCQ’s from Biology, Physics, Chemistry and English. Only those students can get good marks in MDCAT test who clear concepts in details. D.G khan medical college is one of the public sector medical college of Punjab. D.G Khan medical college offers 100 MBBS seats each year. In 2018 the highest merit of D.G Khan medical college is 89.8273 and lowest merit is 89.1485. This entry was posted in UHS MCAT and tagged Best way to prepare for UHS MCAT, biology mcqs, chemistry mcat, DG khan medical college, DG khan medical college 2018, DG khan medical college first merit list, DG khan medical college first merit list 2018, DG khan medical college merit list, DG khan medical college merit list 2018, how to prepare mcat, Important Chemistry Topics UHS MCAT, important mcat topics, MCAT 2018, MDCAT, MDCAT 2018, MDCAT Biology MCQs, MDCAT entry test, MDCAT Merit list 2018, mdcat result, MDCAT solved MCQs, mdcatmdcat, New Physics Syllabus for UHS MCAT, New UHS MCAT Syllabus, punjab mcat, Punjab MCAT Biology MCQs, Punjab MCAT Chemistry MCQs, Punjab MCAT English MCQs, Punjab Mcat format, punjab mcat mcqs, punjab mcat merit list, Punjab MCAT New Syllabus, Punjab MCAT Past Papers, Punjab MCAT Physics MCQs, Punjab Mcat result, Punjab MCAT Scholarships, Punjab MCAT Solved Papers, REGISTRATION MCAT, Sample UHS MCAT MCQs, UHS MCAT 2015, UHS MCAT 2017, UHS MCAT 2018, UHS MCAT Aggregate Score, UHS MCAT Biology MCQs, UHS MCAT Chemistry MCQs, UHS MCAT Dates, UHS MCAT Documents, UHS MCAT English MCQs, UHS MCAT Entrance Test, UHS mcat merit list, UHS MCAT Online Preparation, UHS MCAT Past Papers, UHS MCAT Preparation, UHS MCAT syllabus 2017, UHS MDCAT Dates, UHS Physics MCQs on November 14, 2018 by Pakprep.com Admin. Federal Board of Intermediate and Secondary Education (FBISE) announced its exam schedule for HSSC classes. Exams for FA/FSC are going to start from 17th April till 28th May. However FSC (Pre-Engineering) and Fsc (Pre-Medical) exams will end in mid of May. Students of Fsc (Pre-Engineering) and Fsc (Pre-Medical) have to appear in Entry tests of different universities for Pakistan like (NUST, GIKI, Fast, ETEA, MCAT, ECAT, NUMS, Sindh MCAT, PIEAS, FMDC, NTS and other universities) to secure their admission for further studies. Pakprep.com Provides complete material for the preparation of top Engineering universities and Medical colleges of Pakistan. 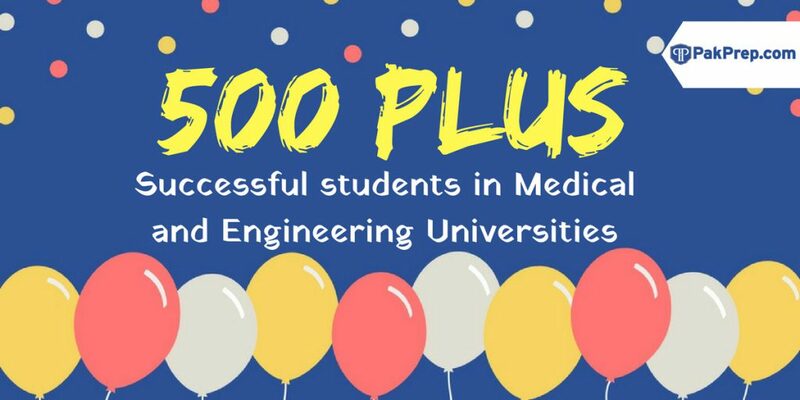 We have more than 15,000+ fully explained MCQ’s and MOCK test which helps students to score good marks in Entry test to secure their admissions in Top ranked universities and Medical Colleges. We recommend students to login at pakprep.com and start your preparation as early as possible to get prepared for challenging entry test. To start your preparation Click here. This entry was posted in FBISE and tagged Balochistan MCAT MCQs, Best way to prepare for NTS, Best way to prepare for NUST, Best way to prepare for UHS MCAT, Biology, biology mcqs, chemistry mcat, Download NUST NET Past Paper, download UHS MCAT Papers, ECAT, ECAT 2017, ECAT Chemistry MCQs, ECAT English MCQs, ECAT Maths MCQs, ECAT MCQs, ECAT Online, ETEA Biology MCQs, etea mcat, ETEA MCAT Past Paper, FBISE, FBISE Chemistry MCQ's, FBISE date sheet, FBISE date sheet 2017, FBISE English MCQ's, FBISE Maths MCQ's, FBISE Part 1 Date Sheet, FBISE Part 2 date Sheet, FBISE past papers, FBISE Physics MCAQ's, FBISE Physics MCQs, Federal Board results, fmdc, FMDC Biology MCQs, FMDC Chemistry MCQs, FMDC English MCQs, fmdc mcqs, FSc Biology MCQs, GIKI, GIKI 2017, GIKI Admission, GIKI Application 2017, giki maths, GIKI Maths Syllabus, giki physics, giki physics mcqs, giki solved mcqs, GIKI undergraduate, How many MCQs in Sindh MCAT, How much marks I need in NUST NET?, How to Calculate NUST Aggregate, How to Prepare for NUST NET 2017, How to Prepare for Sindh MCAT, How to prepare Punjab Mcat UHS, How to prepare PUNJAB UHS Mcat, How to Register for NUST NET Test, Important Chemistry Topics Punjab MCAT, NTS Biology, NTS Biology MCQ's, NTS Chemistry, NTS Chemistry MCQ's, NTS Chemistry MCQ's Preparation, NTS Engineering, NTS Engineering test pattern, NTS English MCQ's, NTS NUMS, NUMS Biology MCQs, NUMS Chemistry MCQs, NUMS English MCQ's, NUST, Nust Admission Test, NUST Biology MCQs, Nust Chemistry MCQs, NUST English MCQs, NUST Maths MCQs on April 3, 2017 by Pakprep.com Admin. This entry was posted in FMDC, NTS, NTS NAT and tagged best way to prepare for entry tests, Best way to prepare for Entry Tests in Pakistan, Best way to prepare for NTS, biology mcqs, chemistry mcqs, english mcqs, entry test preparation, fmdc, FMDC Biology MCQs, FMDC Chemistry MCQs, FMDC English MCQs, fmdc entry test, fmdc mcqs, FMDC Online Entry Test Preparation, FMDC Past Papers, FMDC Physics MCQs, FMDC solved MCQs, fmdc solved papers, FMDC Test, fmdc test pattern, FMDC test Pattern 2016, How to Download NTS form, mbbs, MBBS 2016, MBBS admission, MBBS Admission Test, MBBS in Pakistan, mbbs merit list, Medical colleges in Islamabad, NTS, NTS Biology, NTS Biology MCQ's, NTS Chemistry, NTS Chemistry MCQ's, NTS English, NTS English MCQ's, nts fee, NTS IM, NTS MCQs solved, NTS Medical, NTs Medical Test, NTS NAT Preparation, NTS old papers, NTS Pakistan, NTS Past Papers, NTS Physics, NTS Physics MCQ's, NTS Preparation Online, NTS Solved paper, nts solved papers, NTS test, online preparation for NTS test on September 22, 2016 by Pakprep.com Admin. This entry was posted in AJ&K Medical, Entry Test Preparation and tagged AJ&K, AJ&K 2016 admissions, Aj&k admission test 2016, AJ&K biology MCQs, AJ&K bioology, AJ&K medical admission 2016, AJ&K medical college admission dates 2016, AJ&K medical colleges, AJ&K Medical colleges admission, AJ&K medical colleges admission dates, BDS, BDS Admissions, bds merit list, BDS test, Biology, biology mcqs, Chemistry, chemistry mcqs, chemistry solved MCQS, FSc Physics MCQs, MBBA AJ&K, mbbs, MBBS 2016, MBBS addmissions AJ&K, MBBS admission, MBBS Admission Test, MBBS Admissions 2016 AJ&K, MBBS Admissions AJ&K, MBBS in AJ&K, MBBS in Pakistan, mbbs merit list, medical, Medical Admission, medical college admission, medical entry test, medical mcqs, Mipur medical college admission, Mirpur medical college, Mirpur Medical college admission dates, Mirpur medical college test, mirpur medical college test dates, Mirpur Medical college Test pattern, organic chemistry, Physics, physics mcqs, Physics solved mcqs, Solved Physics MCQs, Test pattern on August 15, 2016 by Pakprep.com Admin. Punjab MCAT is a test for Public sector medical colleges in Punjab, it is also known as Medical colleges Admission test. Every year thousands of students appears in MCAT from Punjab and Islamabad but only few students get change to take admission on the basis of good test score. UHS is enter linked with 19 Public sector Medical colleges of Punjab. Subjects included in MCAT test are Physics, Biology, Chemistry, and English. Pakprep.com provides complete course work for the preparation of MCAT entry test. Click here to start your preparation. Here are important Chemistry MCQ’s for UHS MCAT. This entry was posted in Punjab UHS MCAT, UHS MCAT and tagged best way to prepare for entry tests, Best way to prepare for Entry Tests in Pakistan, Best way to prepare for UHS MCAT, biology mcqs, chemistry mcqs, Dental Entry Test UHS, english mcqs, entry test preparation, Entry Test Preparation 2016, How to prepare Punjab Mcat UHS, How to prepare PUNJAB UHS Mcat, Important Chemistry Topics UHS MCAT, MBBS admission, MBBS Admission Test, MBBS in Pakistan, mbbs merit list, Nust Chemistry MCQs, Online Entry Test Preparation, Preparation of Document for UHS MCAT, punjab mcat, Punjab MCAT Biology MCQs, Punjab MCAT Chemistry MCQs, Punjab MCAT Past Papers, punjab medical admission, punjab medical test, Punjab UHS MCAT, Punjab UHS MCAT Syllabus, Punjab UHS Medical Test, Sample UHS MCAT MCQs, UHS, UHS Admission, UHS Admissions, UHS Biology MCQs, UHS Chemistry MCQs, UHS English MCQs, UHS Entry Test, UHS Entry Test 2015, UHS Fee, UHS MCAT, UHS MCAT 2016, UHS MCAT Aggregate Score, UHS MCAT Biology MCQs, UHS MCAT Chemistry MCQs, UHS MCAT Dates, UHS MCAT Documents, UHS MCAT English MCQs, UHS MCAT Entrance Test, UHS MCAT Online MCQs, UHS MCAT Online Preparation, UHS MCAT Past Papers, UHS Medical Admission, uhs merit list, UHS Past Papers, UHS Scholarships, UHS Solved MCQs, UHS Solved Papers, UHS Test format on July 29, 2016 by Pakprep.com Admin. Federal Medical and Dental College (FMDC) is the first public sector (Government)Medical college established in the capital city of Pakistan, Affiliated with SZABMU-PIMS. FMDC MBBS admission test will be conducted by National Testing Service (NTS). Pakprep.com features the mock test for FMDC that simulates the exact test for FMDC. Solving actual test format is key for you success. Join www.pakprep.com now to get admission into FMDC. This entry was posted in Entry Test Preparation, FMDC, Pakprep and tagged Biology, biology mcqs, CAE Physics MCQs, Chemistry, chemistry mcat, chemistry mcqs, english mcqs, Entry Test, entry test preparation, Entry Test Preparation 2016, ETEA Biology MCQs, ETEA Chemistry MCQs, fmdc, FMDC Biology MCQs, FMDC Chemistry MCQs, FMDC English MCQs, fmdc entry test, fmdc mcqs, FMDC Online Entry Test Preparation, FMDC Past Papers, FMDC Physics MCQs, FSc Biology MCQs, FSc Chemistry MCQs, FSc Physics MCQs, GIK Physics MCQs, Important Chemistry Topics Punjab MCAT, Important Chemistry Topics UHS MCAT, Important Physics Topics NUST NET, inorganic chemistry, KPK Chemistry MCQs, KPK ETEA Biology MCQs, Mehran University Biology MCQs, NUST Biology MCQs, Nust Chemistry MCQs, NUST NET 2015 Physics MCQs, NUST NET Biology MCQs, NUST NET Chemistry MCQs, organic chemistry, Physics, physics mcqs, Punjab MCAT Biology MCQs, Punjab MCAT Chemistry MCQs, punjab medical test, Punjab UHS Medical Test, Sindh MCAT Biology MCQs, Sindh MCAT Chemistry MCQs, sindh medical test, Solved Physics MCQs, UET Lahore Chemistry MCQs, UET Peshawar Chemistry MCQs, UHS Biology MCQs, UHS Chemistry MCQs, UHS English MCQs, UHS Entry Test, UHS MCAT Biology MCQs, UHS MCAT Chemistry MCQs on December 17, 2015 by Pakprep.com Admin. For public medical colleges in Punjab admission test called Punjab UHS MCAT is administered by University of Health Sciences. Punjab UHS MCAT is applicable in all public sector medical colleges in Punjab and AJK as well. Pakprep.com provide a state of the art on line self preparation system for UHS MCAT. UHS MCAT is from selected topics of FSc course work and Pakprep.com system lets you practice MCQs only related to UHS MCAT syllabus. Thus you do not waste time on non UHS MCAT MCQs. Register today for free at Pakprep.com to prepare for UHS MCAT 2016. This entry was posted in Pakprep, Punjab UHS MCAT, UHS MCAT and tagged biology mcqs, chemistry mcqs, english mcqs, How to Prepare for Punjab MCAT, How to Prepare for UHS MCAT?, How to prepare PUNJAB UHS Mcat, MBBS Admission Test, physics mcqs, Punjab MCAT 2015 Online Preparation, Punjab MCAT 2016, Punjab MCAT Biology MCQs, Punjab MCAT Chemistry MCQs, Punjab MCAT English MCQs, Punjab MCAT Past Papers, Punjab MCAT Physics MCQs, punjab medical admission, punjab medical test, Punjab UHS MCAT, Punjab UHS MCAT Syllabus, Solved Punjab MCAT MCQs, Solved Punjab MCAT Past Papers, UHS, UHS Biology MCQs, UHS Chemistry MCQs, UHS English MCQs, UHS MCAT 2016, UHS Past Papers, UHS Physics MCQs, UHS Solved MCQs on November 28, 2015 by Pakprep.com Admin. FSC (Pre-Medical) with Minimum 60% marks or Equivalent foreign qualification. Those who appear in Punjab MCAT conducted by provincial Government. Pakprep.com provides the complete coursework for Medical Entry Test. Register here today for FREE to start your Preparation. This entry was posted in Biology, Entry Test Preparation, NTS, NTS NAT, Pakprep and tagged allama iqbal medical college, biology mcqs, chemistry mcqs, english mcqs, Entry Test, entry test preparation, How to Prepare for Punjab MCAT, How to prepare Punjab Mcat UHS, How to prepare PUNJAB UHS Mcat, Important Chemistry Topics Punjab MCAT, Important Punjab Mcat topics, Join Pakistan Army as Medical Cadet, mbbs, MBBS admission, MBBS Admission Test, MBBS in Pakistan, mbbs merit list, MBBS Seats in Punjab, medical college admission, medical entry test, medical mcqs, nust medical, NUST Medical Admission Test, NUST Medical Past Paper, NUST Past Papers Medical, physics mcqs, Punjab Accredited Engineering Universities, Punjab Board MCQs, punjab mcat, Punjab MCAT 2015, Punjab MCAT 2015 Online Preparation, Punjab MCAT Biology MCQs, Punjab MCAT Chemistry MCQs, Punjab MCAT English MCQs, Punjab Mcat format, Punjab MCAT Past Papers, Punjab MCAT Physics MCQs, punjab medical, punjab medical admission, Punjab Medical Admission UHS, Punjab Medical Entry Test, punjab medical test, Punjab UHS MCAT, Punjab UHS MCAT Syllabus, Punjab UHS Medical Test, rawalpindi medical college, sindh mbbs, Sindh MCAT 2015, Sindh MCAT MCQs, Sindh Medical Colleges, Sindh Medical MCAT, sindh medical test, Solved Punjab MCAT MCQs, Solved Punjab MCAT Past Papers, UHS, UHS Medical Admission, UHS Medical Entry Test, UHS Past Papers on November 13, 2015 by Pakprep.com Admin. This entry was posted in Aga Khan, Biology, Entry Test Preparation, NTS, Pakprep, Sindh Medical MCAT, Sindh NTS and tagged Aga Khan MBBS, Aga Khan MCQs, Aga khan Medical College, Aga Khan Medical Past Papers, Agha khan mbbs, agha khan mcqs, AKU Past Papers, allama iqbal medical college, AMC Biology MCQs, AMC Past Papers, Army Medical College, ayub medical college, biology mcqs, Dow medical college, ETEA Biology MCQs, FMDC Biology MCQs, fmdc mcqs, How many MCQs in Sindh MCAT, How to Prepare for Sindh MCAT, king edward medical college, mbbs, MBBS admission, MBBS Admission Test, MBBS in Pakistan, mbbs merit list, MBBS Seats in Punjab, medical entry test, medical mcqs, NTS, NTS NAT Preparation, NTS Pakistan, NTS Past Papers, NTS Preparation Online, nust medical, NUST Medical Past Paper, online entry test mcqs, Past Papers, sind, sindh mbbs, Sindh MCAT 2015, Sindh MCAT Biology MCQs, Sindh MCAT Entrance Test, Sindh MCAT MCQs, Sindh MCAT Online Preparation, Sindh MCAT Past Papers, Sindh MCAT Pattern Format, Sindh MCAT Scholarships, Sindh Medical Colleges, Sindh Medical Entry Test, Sindh Medical MCAT, sindh medical test on November 2, 2015 by Pakprep.com Admin.